Penngrove Plaza - "The Grove"
Located in the small town of Penngrove, The Grove sits at a prominent crossroads of the community at the edge of the downtown. With streets on three sides and a creek to the north, this mixed-use center has two buildings with 12,900 square feet of retail space and 8 apartments. The single story retail building sits at the intersection of the streets while the two-story building, with retail on the ground level and apartments on the second level, is sited to the north. The buildings are rural residential in character, with horizontal wood siding and bracketed gabled roofs with broad overhangs and porches. The second floor apartments are served by an elevator and overlook the wooded creek to the north. Their downtown location was popular and they were quickly rented by the building’s owner. 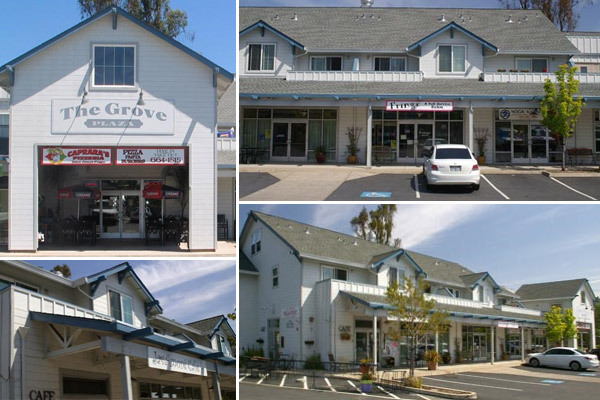 The Grove has integrated well into the architectural and social fabric of downtown Penngrove.